Huntsville, TN (2018-09-12) A Pioneer man is facing a long list of charges after authorities allegedly found more than 35 grams of meth in his car. Authorities say the suspect initially refused to stop his vehicle, and then attempted to flee on foot from the scene. 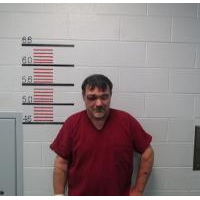 Mark Mason, 47, of Pioneer was booked into the Scott County Jail early Tuesday morning following a traffic stop in the Cherry Fork community. According to an arrest warrant penned by K-9 Deputy Tyler Johnson of the Scott County Sheriff’s Office, Mason allegedly had 35.75 grams of methamphetamine inside a backpack in his car. Authorities say Mason had a set of digital scales, a snorting straw, and a spoon for scooping the meth inside the same container. Johnson says that Mason refused to stop his Toyota Corolla for him at the intersection of Scott Highway and Cherry Fork Road. Instead, Mason is accused of speeding off and going to a residence about a mile away. Authorities say that speeds topped out near 55 m.p.h. on Cherry Fork Road. Once he stopped, Mason reportedly refused to stay in his vehicle. On multiple occasions, authorities say that Mason attempted to get out the car despite verbal commands otherwise. Once removed from the car, Mason is further accused of interfering with officers who were attempting to search his vehicle. Authorities say he repeatedly came back to the car and attempted to remove items from it. When Johnson found the backpack, Mason allegedly reached across the hood of the car and attempted to take it from him. After finding the drugs, authorities attempted to arrest Mason, but he allegedly pulled away from them and attempted to run. Investigator Dustin Burke of the Oneida Police Department, who was assisting on the stop, reportedly tackled Mason. Authorities say that Mason continued to struggle, and officers had to forcibly restrain him. Authorities say that Mason admitted that the tags on the car were registered to another vehicle, and he didn’t have insurance on it. Mason was charged with possession of meth (a schedule II controlled substance) for resale, felony evading arrest, evading arrest, felony possession of drug paraphernalia, resisting arrest, possession of drug paraphernalia (three counts), speeding, violation of the registration law, violation of the financial responsibility law, and failure to maintain his lane of travel.